(14842, Heye Foundation Collection, OHS). Born on September 21, 1864, on a farm in Cherokee County, Alabama, future U.S. Rep. James Sanford Davenport was the tenth of eleven children born to William A. J. and Amanda C. Davenport. In 1880 the Davenports moved to Faulkner County, Arkansas, and farmed near Conway. Educated in the local schools and at Greenbrier Academy, the future solon did not attend college. Nevertheless, he aspired to become an attorney, and while teaching school in rural Faulkner County, he also studied law in the office of G. W. Bruce. In 1890 Davenport was admitted to the Arkansas bar. That same year he moved to Indian Territory and was admitted to practice law. In 1891 he joined a law firm with offices in Muskogee and South McAlester. Two years later he moved to Vinita, and he also practiced law there. 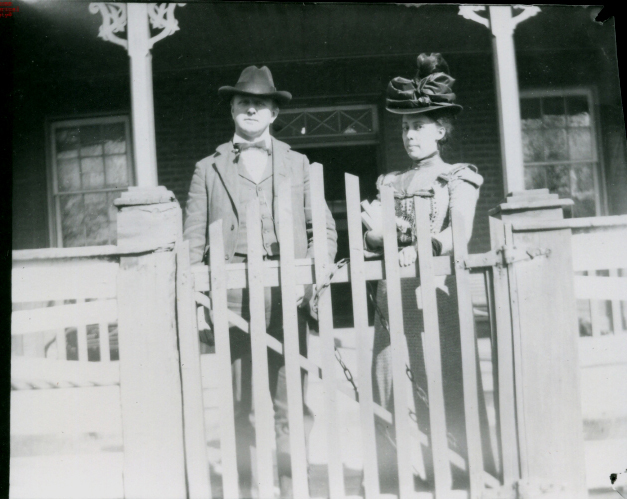 In 1892 Davenport married Guelielma Ross, great-granddaughter of John Ross, the longtime principal chief of the Cherokee Nation. The Davenports had three children. Guelielma Davenport died in 1898. In 1907 Davenport married Byrd Ironside, also a member of the Cherokee Nation. As an intermarried citizen of the tribe, he served as a member of the Cherokee National Council from 1897 to 1901 and was speaker of the Cherokee lower house the last two years. From 1901 to 1907 he was an attorney for the tribe and was instrumental in putting freedmen on allotment rolls. Always active in organizing the Democratic Party in Indian Territory, Davenport was among the first Oklahomans elected to the U.S. Congress in 1907. Defeated for reelection to the Third District seat in 1908, he recaptured it in 1911 and served until 1917. Although Davenport contested the 1916 election, Republican challenger Thomas Alberter Chandler won the subsequent court case. While in Congress, Davenport served on committees including Expenditures in the War Department, Territories, Insular Affairs, and Roads. The congressman was a member of the committee that created the first roads and highways committee in the U.S. House. In 1917 Davenport returned to Vinita and resumed his law practice. In 1926 he again entered public service when he was elected a judge of the Criminal Court of Appeals of Oklahoma. Because of his service on the bench, Davenport etched a lasting mark on Oklahoma's judicial history. Reelected to this position twice, he was serving at the time of his death on January 3, 1940, in Oklahoma City. He was interred in Fairview Cemetery in Vinita. Contested-Election Case of James S. Davenport v. T. A. Chandler from the First Congressional District of Oklahoma (Washington, D.C.: GPO, 1918). Thomas H. Doyle, "James Sanford Davenport: Lawyer, Statesman and Judge, 1864–1940," The Chronicles of Oklahoma 22 (Winter 1944–45). Carolyn G. Hanneman, "Davenport, James Sanford," The Encyclopedia of Oklahoma History and Culture, https://www.okhistory.org/publications/enc/entry.php?entry=DA013.